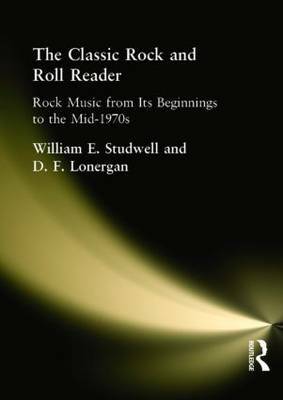 The Classic Rock and Roll Reader: Rock Music from Its Beginnings to the Mid-1970s is chock full of entertaining essays to inform and delight you about an era that shaped our culture and future musical trends. This unique book will surprise and enchant even the most zealous music buff with facts and information on the songs that reflected America's spirit and captured a nation's attention. The Classic Rock and Roll Reader is offbeat, somewhat irreverent, ironic, and ancedotal as it discusses hundreds of rock and non-rock compositions included in rock history era. The songs offer you information on: Rock's Not So Dull Predecessors (for example, "Bewitched, Bothered, and Bewildered" and "The Cry of the Wild Goose") The Pioneering Rock Songs (such as "Rock Around the Clock" and "Shake, Rattle, and Roll" ) Older Style Songs Amidst the Rocks (for example, "I Could Have Danced All Night" and "Rocky Mountain High" ) The Megastars and Megagroups (such as "Blue Suede Shoes," "Respect," and "Surfin'USA" ) The Best Songs that Never Made No. 1 (for example," I Feel Good" and " Tie a Yellow Ribbon Round the Ole Oak Tree" )The Classic Rock and Roll Reader: Rock Music from Its Beginnings to the Mid-1970s also examines the music which preceded early rock, the music which followed early rock, and the numerous non-rock songs which flourished during the classic rock period. A wide spectrum of music is discussed in well over 100 essays on various songs. Musicians, librarians, and the general audience will be taken back to the birth of rock and roll and the various contributing influences. Analyzing each song's place in rock history and giving some background about the artists, The Classic Rock and Roll Reader offers even the most avid music enthusiast new and unique information in this thorough and interesting guide.